I read this article and found it very interesting, thought it might be something for you. 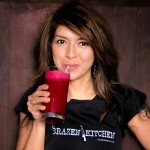 The article is called Meet MVP Leah Lizarondo and is located at http://www.gardendish.com/meet-mvp-leah-lizarondo/. We’re happy to introduce you to Leah Lizarondo—a Pittsburgh entrepreneur with a passion for educating others on the importance of eating whole and healthy. By adjusting her diet, Leah cured herself of the symptoms and pain she was suffering due to fibromyalgia. Not only is Leah extremely involved in the community, the foodie writer for Pittsburgh Magazine and an editor-at-Large at NEXT Pittsburgh, but she also created The Brazen Kitchen blog. Leah created her blog when she began transitioning to a more plant-based lifestyle to find and share delicious recipes that were actually good for you. Now, Leah loves to share the joy and benefits of eating healthy and works with people that want to transition to a healthier way of eating. She was even a speaker at Tedx Talk: Why the Farm is Not Getting to the Table (watch below!) in 2014. But don’t worry, despite all that she’s got going on, she still posts recipes online. Leah’s doctor diagnosed her with fibromyalgia while she was still in her 20’s and prescribed her pills to treat the symptoms. “After a few years of taking those pills, I asked when I was going to be cured. He basically said that I won’t be. I’d have to take these pills forever,” Leah said. Fibromyalgia is a chronic condition that doctors call idiopathic, meaning no one has determined what exactly causes fibromyalgia. When Leah found out she was pregnant with her first child, she knew she had to stop taking the pills. She said she didn’t want to be on prescription pills during and even after her pregnancy, so she began researching for a natural way to ease her fibromyalgia. That’s when Leah learned about how animal products cause inflammation and how she got the motivation to begin eliminating animal products. She said that she did eat largely plant-based during her pregnancy, aside from eating eggs to help boost the fat content in her diet. “I went online. I read books. I liked The China Study a lot; I think that’s a really good book. After reading it, I would always steer people to be more plant-based but never push because that is often counterproductive. I like to meet people where they are and encourage building on good habits gradually. I think that as long as you keep the animal products to 10 to 20 percent of your diet, you will be less likely to get cancer and be healthier overall,” Leah said. For fighting a cold, Leah swears on Manuka honey. “It has a lot of minerals that help with congestive issues. It works for me if I take my Manuka honey with raw garlic. My son is prone to chest congestion—I would make him toast and spread that on it and he will eat it without batting an eyelash,” she said. Leah stressed that she doesn’t want people turned off to a plant-based diet. “Once you do eat mostly plant-based you become more aware and lean more towards that. I couldn’t imagine feeding my kids regular supermarket meat. I buy local pasteurized beef or chicken,” she said. Thinking back centuries ago, Leah said people most likely subsisted on one animal—dried and cured—for a long period of time and also heavily relied on gathering greens, seeds, nuts and fruits for food. “People eat so much of it; we’re killing for nothing. We don’t need it. Your body doesn’t need it. It’s not good for us nor the environment,” she said. Unlike most people, Leah said, she looks at meat as a side instead of vegetables. Leah said she often hears from clients and non-clients alike that they don’t have time to cook a healthy meal at home. She responds by telling them what she cooks. “It’s not complicated food. It’s different iterations of beans and rice—lots of different flavors using the same base,” she said. Leah said that she thinks most vegans are doing a great thing and making better eating choices, but feels as though following a strict no-meat diet can deter some people. “Doing what you can is always the best thing. Once you take one step, it’s easier to take the next and the next and the next. I would encourage anyone who wants to eat more plant-based to try it and see how it goes—and not feel they have to adhere to a label,” Leah said. She said that she feels being militant about eating a vegan diet makes people want to turn their ears off instead of listening. “My work makes it hard because I do write about food—and not exclusively vegan food. There have been occasions where I’ve had to taste something I knew had meat or fish in it. My motivations are health-wise, less ethical,” Leah said that she isn’t a “purist,” meaning she eats plant-based the majority of the time, but occasionally eats meat or animal byproduct. “I don’t feel I’m against the cause,” she said. Leah said she likens people’s bad eating habits to being in an abusive relationship. “People who are co-dependent, or are not secure with themselves or have love for themselves, would stay in that relationship and depend on it for outside affirmation. It’s the same with food. We take in food that tastes good when we’re eating it, but in the long run it’s not good for us,” she explained. Leah said that while eating a doughnut once in a blue moon is fine, eating a doughnut daily is not respectful to her body. If you live in the Pittsburgh, Pennsylvania area, Leah recommends Eden and Amazing Café. “The Amazing Café has the best raw carrot cake that I’m addicted to. The cream cheese is so buttery and tasty,” Leah said, adding that Asian restaurants are always good places to eat plant-based. She noted that most restaurants will have a vegetarian or vegan sign on the menu to make ordering easier.